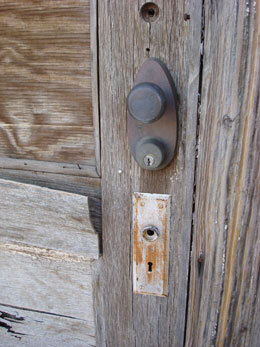 As I was photo-safari-ing two small west Texas towns, I saw this door. The owners installed several locks to keep their possessions safe. The last time anything valuable was stored on the other side of that door was more than 30 years ago. Lots of time and energy were spent building that store. Its usefulness is fully over. The land is not worth the price of demolition. Chillicothe will never see a population growth again. True – the builders of that establishment probably got good return on their investment during its lifespan. But what better way might they have spent their time? If they had invested the same amount of energy in a building that is still being used, how much better would that have been? Takeaway: What are you investing in that will last? What ways should you change what you are doing to make those efforts last longer? p.s. I’m taking a break. We’re heading for the hills as a family for about the next week. (No internet where we’ll be. And the break is much needed.) I hope to have a new post for you on Monday July 20th. Have a great break Paul. Catching up on your posts it sounds that you could do with the rest. Thanks for sharing the last few weeks. Will remember you specially this weekend.